While the East Coast recovers from Hurricane Sandy, the PR forces at both NAB and CTIA are using the occasion for a Twitter war to take advantage of people’s misery, not doubt with an eye on the pending incentive auctions. The above 2 tweets showed up in my Twitter Digest. 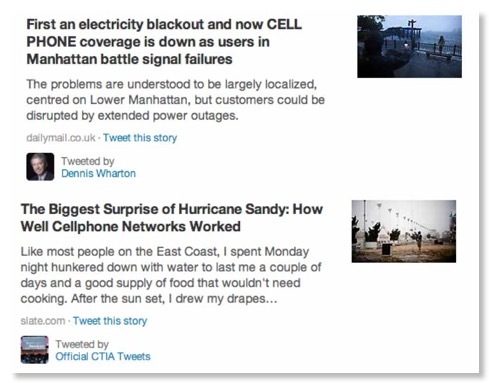 The top tweet from NAB’s Dennis Wharton, Executive VP, Media Relations, links to this Reuters article entitled “Hurricane Sandy disrupts Northeast U.S. telecom networks” which includes the line “Cellphone service was spotty for top wireless providers Verizon Wireless, AT&T Inc and T-Mobile USA, a unit of Deutsche Telekom, according to some customers.” However the article did not focus on cellphone issues and dealt with wirelines, CATV, and cellular issues. Like the terrorist attacks of 2001 and the blackout of 2003, Sandy has exposed the limitations of the cellphone. Not only does it require electricity for charging, but the cellphone also won't pick up service if a major storm has knocked out the telecommunications infrastructure that provides reception. Genachowski said that as of 10 a.m. ET today, 25 percent of the nation's wireless companies' cell sites were not operational in 158 counties in 10 states from Virginia to Massachusetts. This information comes from the carriers themselves, which report outages to the FCC as part of the agency's Disaster Information Reporting System (DIRS).Genachowski and David Turetsky, who is the FCC's public safety and home security bureau chief, explained that the number of cell sites and cable customers without service was greater in areas where there has been more storm damage. And they emphasized that the storm is still ongoing as it travels westward to states such as Michigan. And they are expecting more disruptions as the storm progresses. HuffPo has a similar report. CTIA and NAB: This is not the time to be name calling or be defensive of past actions. Please stop your Twitter war. Let’s focus on restoring service and on how to make communications policy more responsive to national needs, not just the near term problems of your industry. The November 2 WSJ has an article entitled “Outages Expose Wireless Carriers' Backup Plans”. Last year, the FCC proposed that the industry explore wireless networks that can be operated from blimps and unmanned aircraft in a disaster. The wireless industry pushed back, arguing such systems would cause interference. Wireless carriers argue they don't need rules to ensure the reliability of their networks, because it's in their best interest to do so. …"We're pulling up the safety net behind us, and we don't have a new safety net in case something goes wrong," said Harold Feld, legal director for consumer group Public Knowledge. It isn’t often when the WSJ is sympathetic with the Genachowski FCC and quotes Harold Feld and not the CTIA staff. Let me also recommend the evolving discussion of the above article on the WSJ site which contains a variety of view points on this issue, some supportive of the industry, some not. CTIA leadership, you can impress your membership by winning this type of court cases, but is it really worth it? Is it really in the interest of your members or the public? On November 2, the NY Times, which rarely agrees with WSJ on anything, published an article on cellphone outages entitled “Steaming at Hit-or-Miss Service” -- also quoting Harold Feld. In general, the carriers say it is in their own interest to fortify their networks for emergency situations, but Mr. Feld said this incentive was not enough. The unreliability of wireless networks may point to a bigger problem. Over the years, the phone companies have fought off regulators who want to treat them as utilities, arguing that if they are going to stay innovative, they cannot be burdened with the old rules that phone companies dealt with in the landline era. But as a consequence, there are almost no rules about what carriers have to do in an emergency, said Harold Feld, senior vice president for Public Knowledge, a nonprofit that focuses on information policy.